The new 30m Moonen 97 motor yacht is approaching completion and the yard confidently predicts she’ll be ready for cruising this summer. The design began with the four-stateroom concept made popular by the Moonen 84, and gained markedly from the added volume that makes the Moonen 96 so attractive. To keep the profile low and maintain the series image, designer René van der Velden replaced the raised pilothouse of the 96 with a longer flying bridge and sun deck. The interior includes good crew accommodation for a yacht of this size, making the Moonen 97 easily adapted to chartering. 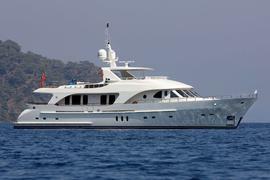 Built in steel and aluminium, the new Moonen 97 is Lloyds classed and MCA compliant, offered by the yard at €9,300,000.